2018 is right around the corner, and with the new year comes a fresh batch of film and television titles on Starz. The pay-cable channel’s streaming service is making some exciting additions in January, and we’ve surveyed the landscape to take stock of everything you need to see. Are we heroes for doing so? No. Well, maybe. 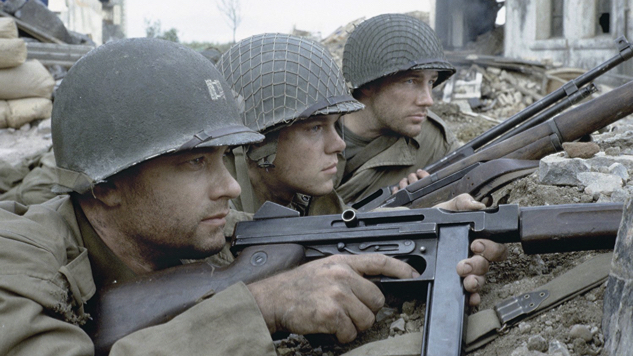 Speaking of heroes, next month’s Starz feature film slate is led by Steven Spielberg’s Oscar-winning WWII blockbuster Saving Private Ryan, which we recently named one of the 100 greatest war movies of all time. Also coming to the service on Jan. 1 are John Hughes’ beloved teen tale Ferris Bueller’s Day Off, Ridley Scott’s sword-and-sandal epic Gladiator and numerous Star Trek films—including 1979’s Star Trek: The Motion Picture, 1982’s Star Trek II: The Wrath of Khan, 1984’s Star Trek III: The Search for Spock, 1986’s Star Trek IV: The Voyage Home, 1989’s Star Trek V: The Final Frontier, 1991’s Star Trek VI: The Undiscovered Country, 1996’s Star Trek: First Contact, 1994’s Star Trek: Generations and 1998’s Star Trek: Insurrection—as well as Chris Farley-starring comedy Tommy Boy and twisty crime caper The Usual Suspects (though we completely understand if you’d rather skip that last one, in light of recent events). Films coming later in the month include Tom Cruise’s iconic Mission: Impossible on Jan. 5, John Patrick Shanley’s haunting Doubt on Jan. 7, original Starz cult documentary The Family on Jan. 8, a handful of Alfred Hitchcock classics—including 1963’s The Birds, 1960’s Psycho, 1954’s Rear Window and 1958’s Vertigo, among others—on Jan. 12, Doug Liman’s oft-quoted dating comedy Swingers on Jan. 19, and a pair of classic Westerns, Sergio Leone’s Once Upon a Time in the West and George Stevens’ Shane, on Jan. 26. How’s that for a month full of movies? There’s much less to get excited about on the small screen, but Starz’s January TV slate is not without a standout: Next month brings the premiere of promising Starz original series Counterpart, starring Oscar winner J.K. Simmons (Whiplash) as a government official who discovers that he has a doppelganger—his counterpart—who has crossed over from a parallel dimension, the gate to which his own agency has been hiding. Starz provided a sneak peek at the series via their app earlier this month, the first episode airs on Starz on Sunday, Jan. 21 at 8 p.m. EST/PST and the second episode becomes available on the app on Jan. 28. Counterpart also stars Olivia Williams (The Sixth Sense), Harry Lloyd (Game of Thrones), Nicholas Pinnock (Captain America: The First Avenger), Nazanin Boniadi (Homeland), Sara Serraiocco (Salvo) and Ulrich Thomsen (The Blacklist). You can watch a trailer for the series here. Be warned: Starz isn’t losing much of consequence at the end of next month, but there are a handful of must-see films that are on their way out. Oscar-winning musical Chicago leaves the streaming service on Jan. 19, while Jan. 31 will see the departure of Roman Polanski crime classic Chinatown, Terry Gilliam’s psychedelic Fear and Loathing in Las Vegas, stony action-comedy Pineapple Express and Jason Reitman’s acclaimed satirical comedy Thank You For Smoking. Toss those on your list before it’s too late, and don’t say we never did anything for you. Find January’s complete assortment of incoming and outgoing titles on Starz below.